The southern side of the Braichmelyn woods is densely populated with coniferous trees. It seems an unlikely place to find a bouldering crag, yet hidden amongst the towering pines is an escarpment of volcanic rock. 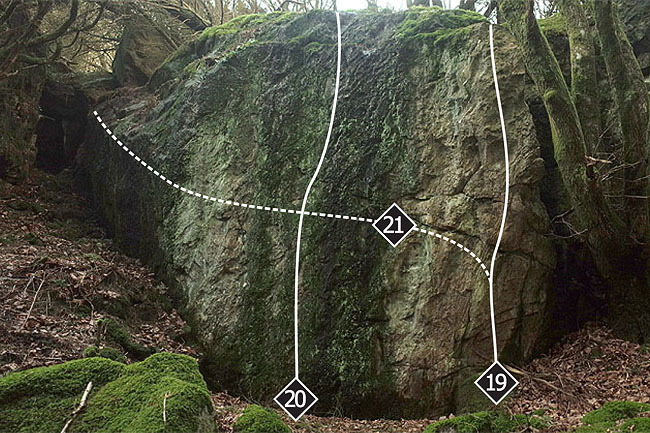 Much of the escarpment is broken or overgrown, but in places it provides some very good bouldering. Many of the problems are highball and the finishes are often dirty and vegetated so make sure you inspect the top outs before you commit! 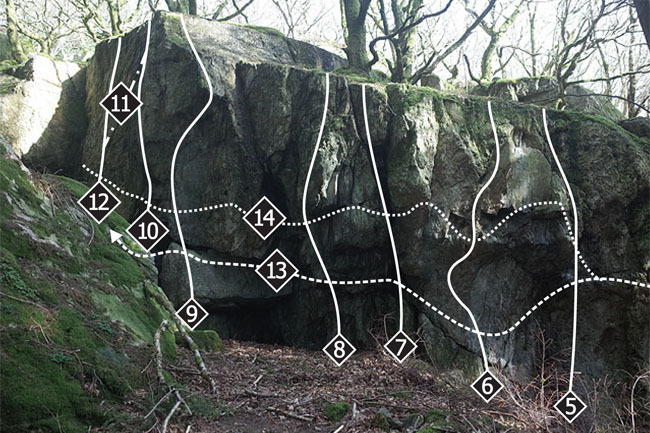 Although it enjoyed a good deal of attention when it was first developed in the mid 80s, recent years have seen parts of the crag become overgrown again. 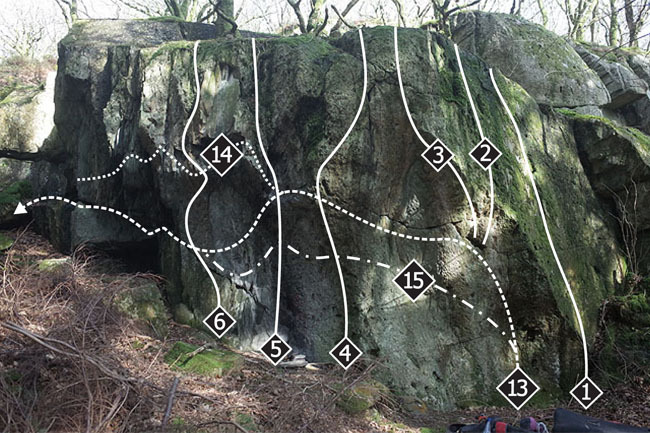 Conditions: The sheltered nature of the crag makes it a good option on windy days, however there are a few obvious downsides. It is fairly slow to dry after rain and there is significant seepage in places. It can also be a midge trap on summer evenings. Approach: From the lay-by next to the Ogwen Bank caravan park entrance on the A5 cross the road and follow the path over a track and up to a large clearing/junction of forest roads and paths. Turn right and follow the path for 50m. 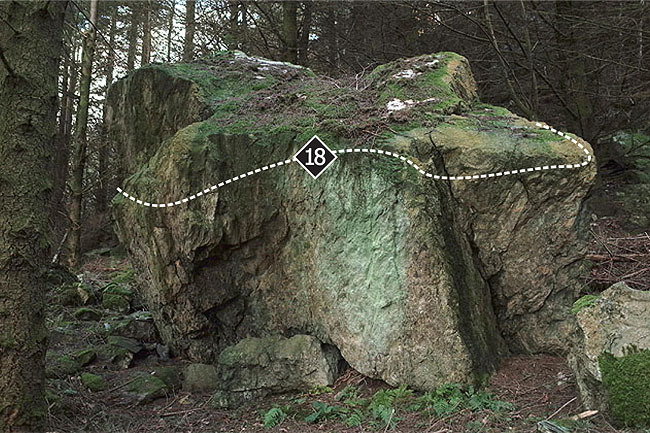 Just before the step in the path (silver Birch trees), turn left and walk up to a statuesque wave of rock that marks the start of the edge proper (and gives the crag its name). 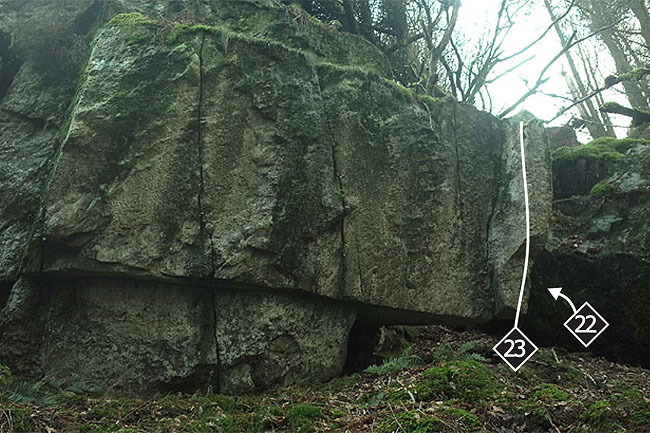 The line left of the hanging crack/groove feature. Start sitting and move up using the left arête. Tricky and powerful moves lead up around the lip of the steepness and onto the obvious fin. 6C+ from standing. 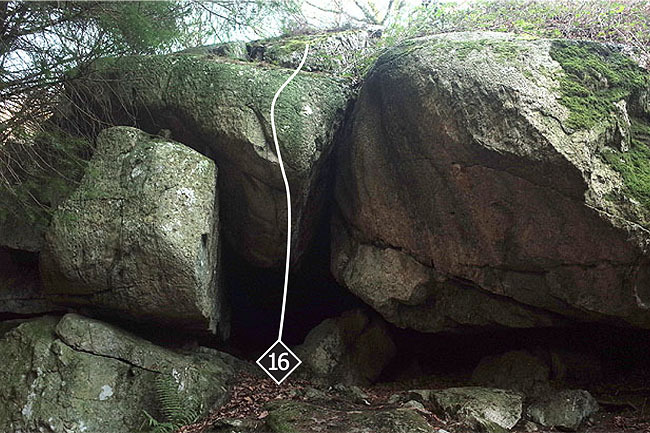 It is possible to climb the narrow groove just right of the big crack (Problem 7) but the rock step landing makes it not very appealing. The dirty crack is best avoided (for obvious reasons) during rainy periods. The sit down start boosts the grade to 6A. The dirty groove to the left has been climbed but is usually too grotty and damp to be worthwhile. 10m farther along the escarpment is a shady alcove. The bulging wall on the right is a hard project line. The hanging crack/groove on the right side of the hanging prow gives a fairly undignified struggle with a fist jam. It was originally done as part of a welly boot circuit developed in the 80s. 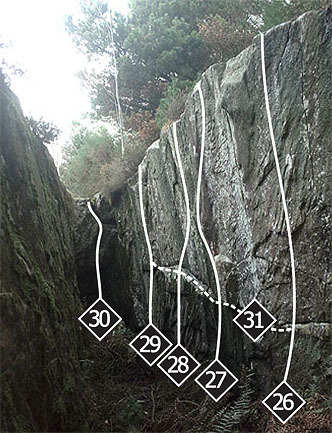 The leaning wall 10m up and left has a half decent pocket line (start as low as you can) and a reasonable lip traverse. 25m farther left there is a free standing block below the escarpment – this has a couple of worthwhile problems. 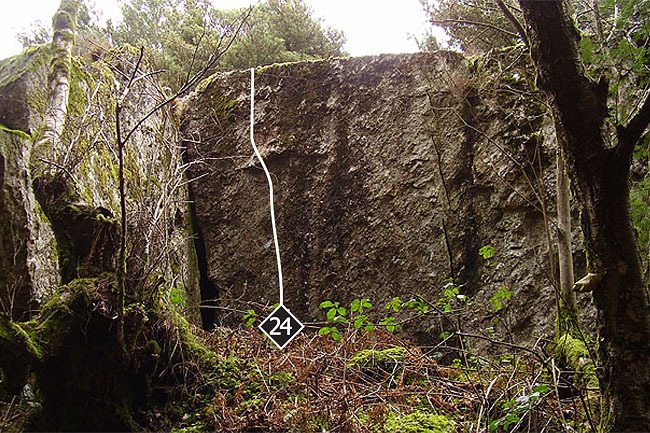 20m farther along the escarpment becomes more pronounced with large walls either side of a gully. On the left wall of the gully there are a few more problems. Descend carefully via the dead tree. Start sitting just left of the old tree. Climb out leftwards to gain a good ledge and then the vegetated top. To the left there are two crack lines and an arête. These look good but the muddy landing slopes away alarmingly and the top outs are rather vegetated. Over in the corner to the left there is another leaning wall with a better landing and a cleaner top out. 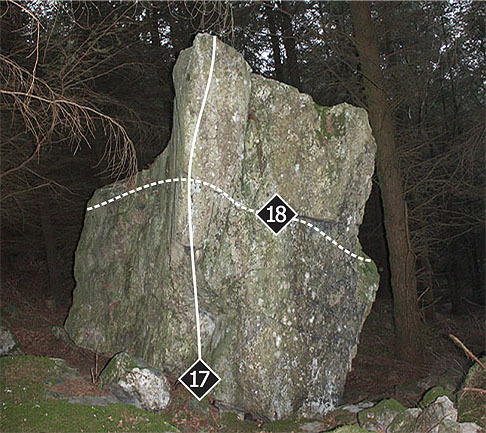 Situated directly behind Pebble Wall is an impressive cleft with smoother rock. It takes a few days to dry out after heavy rain and is best enjoyed with several pads and a spotter as the landing is very jumbled. To reach it walk up the gully to the right of Problem 23 and squeeze through the boulder choke at its end. The right arête climbed from an awkward sit down start. An intensely technical sds tackling the thin crack line at the right side of the steep back wall of the corridor. The stand up version goes at 7A+. Move into the crack from the bulge on the right. 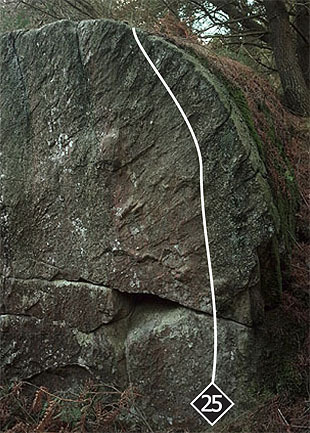 An awkward and tenuous move brings the top within reach and a highball exit. From a hang start on the ramp rock up into the crack and make a difficult move to stand up on the ramp to a scary finish. 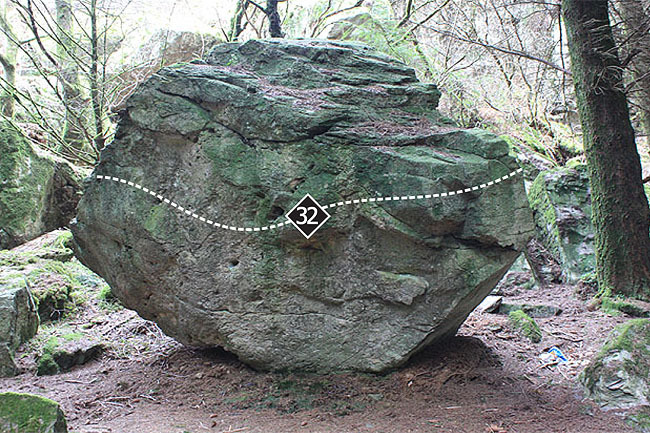 The groove is climbed by a surprising sequence. Start hanging from the ramp below the groove. The roof tucked in at the left side of the Cleft gives a surprisingly good problem. There is an eliminate rule, namely that the side walls should be avoided. From the undercuts at the back reach around to a good hold for your right hand. Make a powerful move to a crimp for your left and dyno for the jug. Finish easily. Starts far right on a triangular flat crimp beyond the bulge. 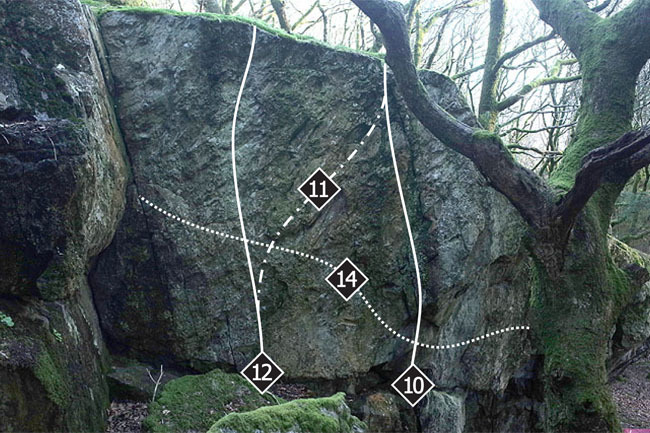 A difficult starting move brings improving holds moving onto the ramp, traverse along this to finish up Groovy Number. Down and left of Pebble Wall there is an attractive free standing boulder.